My name is Anann, a descendant of Lenwë. Name in Lion’s Den and Early American Narratives: I am known as Anann Ni Meadhra, which is Anann O’Meara to the English. Some call me Annie. Ni Meadhra comes from meadhar or “merry”. I am merry only when I look to the stars and think of times long ago. Note: Most of the images, such as Riders of the Sidhe, Fairies in the Garden, Idylls of the King, Dancing Fairies, etc. are in the public domain. The citation for my lovely persona is Queenmebh By Cormac Mccann (Own work) [CC BY-SA 3.0]. The picture of Knocknarea, Maeve's Tomb, and Listoghil/Carrowmore is By Logopin (Own work) [GFDL (http://www.gnu.org/copyleft/fdl.html) or CC BY-SA 3.0 (https://creativecommons.org/licenses/by-sa/3.0)], via Wikimedia Commons. The Passing of the Elves photo comes from the Lord of the Rings. Once our people were mighty and road boldly across the land. Lenwë, my ancestor, was a Telerin Elf who lead our people from Cuivienen behind Olwë. He gained his name, Quenya Lenwë or Sindarin Denweg (“leaving or departure”) not for leaving Cuivienen but for leading his people to the Vales of the Anduin and then forsaking the Great Journey to Valinor in the West. My people called him Dan and we called ourselves the Nandor, the people of Dan. Dan’s son, Denethor, and other Elves heard from the Dwarves of Eriador that there was another Elven group who had not gone to Valinor. The Sindarin king, Thingol, ruled with Melian in Beleriand. Denethor led my people from the Vales of the Anduin to a land called Ossiriand or Lindon. Thingol recognized my people as kin and we became known as the Laiquendi or Green Elves. The forests were our homes. But in the Years of the Trees 1497, Morgoth attacked the Elves. In the First Battle of Beleriand, the Laiquendi, who had little more than swords, bows and arrows, were driven back to Amon Ereb, the Lonely Hill. There, surrounded by orcs, Denethor and the Laiquendi perished. The Years of the Trees faded into the mist and still I was not born. After the death of our king, my people became reclusive and seldom joined in the wars of Beleriand until the time of Beren. Many of my people died at the end of the First Age when Beleriand sank under the waves and our hearts were broken again. Others left for Valinor. My people merged with the Sindarin of Lindon and the Nandorin/Silvan language disappeared. The Second Age of the Sun turned into the Third Age. It was a time of heroes and great deeds. The time of the halflings came. ‘Long live the Halflings! - Cuio i Pheriain anann! Praise them with great praise! - Aglar’ni Pheriannath! The Third Age was passing. Against all hope the halflings, with the help of Gollum and others, destroyed the One Ring. It seemed that the glorious past was over. The time of Men had begun. And still I was not born. Third Age 3020. I was born in the dying years of the Third Age in what was left of Lindon. I was born a little to the southeast of the Grey Havens in a place that would later be called Knockainey in County Limerick, in Munster, Ireland. My mother was a Silvan elf who had been born in the First Age in fabled Beleriand. She had many names, Belaurin, Brethilil (beech), Nemiril (water jewel), Lónannûniel (lit. "west island"; tr. Elv. “isolated”), and Eredhil (“seed”). Her heart was broken when the lands she loved sank under the waves. But then she met my father and her heart was warm again - until he was killed fighting Sauron. I was born into a time of woe. The Ring had been destroyed, but at great cost. We had won but after the destruction of the Ring the Elves would fade and go into the West. I was born into a time of leave taking. My first memory comes from a visit to the Grey Havens when I was only a year old, as Men reckon such things (Elves consider the time of gestation as part of your age). Two little people were getting on a boat with elves and someone my mother said was a wizard. They left behind two other little people on the dock who were crying. My mother said it was an important moment but I was unimpressed. I remember dipping my toes in the waters of the bay later that day and thinking that was more important then seeing two little people getting on a boat. The people in the boat had, of course, been Bilbo and Frodo Baggins. My mother looked back to those long ago times when my father was alive. She looked further back to the time when her beloved Beleriand was kissed by the light of the sun. With her foresight she named me Anann, which is Sindarin for “long ago”. I came of age in the diminished Fourth Age. By then the stories of the Land Under the Waves and the stories of the Halflings, Men, Dwarves, and Elves of the Third Age were a distant memory. But I looked back to those ancient times. I learned the old stories at my mother’s knee and retold them to all who would listen. I recopied the ancient books that recorded our ancient language and our tales. So I grew into my name, Anann. My mother left me when I was scarcely grown to womanhood. I was only 100. In her last days she called herself Dillothel, “silent flower”. Her last words were that I would represent Anann, the time of long ago, to those who followed. Then she turned her face to the sea and faded away. The Irish later wrote their fanciful histories, the Leabhar Gabhala in the 8th century AD. They listed 6 invasions of Ireland. But, being mortals, they did not live during that time and did not know what really happened. My memory is much longer than theirs. Men had moved into Lindon during the Fourth Age, around 7000 BC. They said that when they first came to Ireland there was only “one treeless, grassless plain, watered by three lakes and nine rivers.” In fact, the land was a featureless tundra in the north. But then the trees began to come back to Ireland and the ice melted into lakes and rivers. To the Men it was as if my people were creating the plains, trees, lakes, and rivers. They said the land expanded and that four pains were added and seven new lakes. Then 12 new plains and 4 more lakes were added. Cesair, Partholon, and Nemed were some of the early leaders of the mortal folk. By 4000 BC the mortal folk were building megalithic tombs that became more grand over time. We interacted sparingly with Men for they were becoming very numerous and were easily angered by what they did not understand. During the Fourth Age I was known as a leader of the Tuatha De, the “Tribes of the Elves.” The Tuatha de Danaan were the descendants of the Elves. The humans who later recorded our tales thought we were the “Tribes of the gods”. I called us the Tuatha de Danann, the tribes of Dan who lived during the Years of the Trees. There was a young man among the Tuatha de Danaan who was a natural leader and a great warrior. Where I am somber and thoughtful he was fiery, joyful, and young of heart. He had laughing eyes and was a great storyteller. His name was Nuadu. He later retold the story of our courtship in a way that the ancient Irish could understand. He said as a great warrior he stood up one day and claimed me as his bride. I looked at him and rolled my eyes. I did not move. He was forced to sit down and console himself with mead and ale. This always got a laugh from the Irish. But then my husband would continue the story. He kept courting me year after year. One day, at a great feast, I approached him with a cup of marriage. He rolled his eyes and would not move. This always got another laugh. During the time of the Tuatha de Danann I imparted to the surviving elves all I knew, the wisdom of the Elvish race who had gone before us. The young Nuada became a great leader of the Tuatha de Danaan. He led our people when we quarreled with the mortal inhabitants of Ireland, who were later called the Fir Bolg. We offered them half of Ireland but they refused. So we fought. My husband lost the use of his arm after the First Battle of Mag Tuired, which was against the Fir Bolg. Later legend say he lost his arm that day. He regained the use of his arm with much effort. This is reflected in the legends that say he was given a silver arm and later an arm of flesh. He fought in the Second Battle of Mag Tuired against the Fomorians. Legend said that he died in that battle but that was incorrect. He was gravely wounded and was taken from the battlefield more dead than alive. But in time he recovered. His recovery amazed the local people and his fame spread to what was later called England and Wales. As Nodens he became known as a god of healing, hunting, the sea, and dogs. He was worshipped in Gloucestershire, Gaul, and other places. I still tease him about that. In Wales he is known as Nudd and Lludd. We had four great cities. In legend their names are Findias, Gorias, Murias, and Falias. Murias is a distant memory of Mithlond, the Grey Havens. The ruins lie in the sea off of Galway. 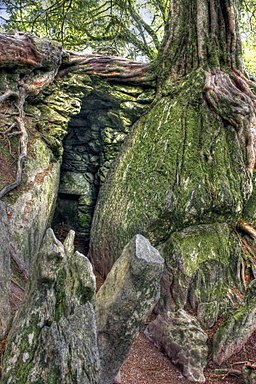 Dagda’s cauldron came from there. Falias is named after the Falas, the west coast of Beleriand that held Brithombar and Eglarest. The Stone of Fal, the Stone of Destiny, stood there. The ruins of Falias lie off of the coast of Sligo. Gorias was named for fabled Gondolin. Lugh’s lance came from ancient Gondolin. And Findias is named for Findis, an elf woman who founded the city. Nuada’s sword was made at Findias. The Tuatha de Danann took what I knew and surpassed me. They ruled over Lindon around 2000 BC. Their stories are still told. But they are all gone now, except for my husband and I. Wars, plagues, and the weight of the world carried them away. We fought the Fomorians. Some said they were the gods of the Iberians and we were the gods of the Gaels but this is not true. Their name, which comes from the Gaelic words for “under sea”, give a hint of who they were. They represented the dark and twisted forces of our age. Some were elves who had turned bitter from the sinking of their beloved Beleriand while others grew bitter from the many defeats over the long years. Others were orcs and Men who had followed Sauron the Deceiver. Their base was on Tory Island off of Donegal. We fought them at a place we called Moytura from the Quenya “moia” (“labour”) and Quenya “tura” (“big”). The Irish later called the place Mag Tuired, which meant “plain of towers or pillars”. It is in County Sligo. A new group of Men moved into Lindon. In time they came to be known as the Fir Bolg (Fir means “Men”) because their descendants assimilated with the Fir Bolg or Belgae of later generations. They came from Celtic Spain. Their subdivisions came to be known as the Fir Domnann (Dumnonii), Fir Gaillion, and Fir Bolg. The Fir Bolg held Ulster, the Fir Domnann held North Munster, South Munster, and Connaught. The Fir Gaillion ruled Leinster. But in time we defeated the Fir Bolg near the village of Cong. We again called the place Moytura from Quenya “moia” (“labour”) and Quenya “tura”, which means “big”. The Fir Bolg moved to Connaught. The descendants of Sreng, one of their warriors, remembered their heritage until the middle of the 17th century, as Men count such things. But we could not hold back the tide of Men. We were finally defeated by the Gaels from the south, the Milesians of legend. They were a different Celtic group from Spain. They came about 500 BC. My name, which meant “long ago” in the language of the Elves, means “pineapple” in Gaelic. How far we have fallen. I left Men behind as much as I could. My kin and I moved into western Ireland. We were there when the Greeks and the Phoenicians visited us at the end of the 4th Age of the Sun. By the 5th Age my people had faded into legend. In the 2nd century AD, when the Romans came and put us on their map. I was at what is now called Sligo. Claudius Ptolemy (who wrote a Greek work called Geography c 150 AD, which was based on the earlier work of Marinos of Tyre) recorded it as Nagnata and the people as the Nagnatae. The people called themselves the Fir Ol nEchmacht. Connacht was called Cóiced Ol nEchmacht. After the disastrous Tuatha de Danann period when we tried to share our wisdom with Men, we kept our knowledge and our literacy to ourselves. The Irish did not learn to write from us. They learned it from the Romans. The Irish developed their own Ogham script around 500 - 700 AD. It was not as sophisticated as our writing system but it fit their needs. By the 6th Age, my people had almost completely faded away. The world had long since forgotten about the Ages of the Sun. Instead, as they measured time, it was the 16th century. This was a difficult time for us. Our people were known as fairies. We lived in mounds, which Men misunderstood as tombs. We were seen as a mischievous and often evil race. They said we stole children and sometimes even wives and husbands. We ruined milk, caused disease, and punished those who were messy. About this time we also began to be equated with witches. It was hard not to fall into despair. But there were a few good associations. Chaucer in the 1300s associated us with music and dance. The Irish absorbed the Normans and ignored the Plantagenets. But the Tudors were another matter. The great Anglo-Irish (or Norman-Irish) family of the Fitzgeralds descended from Gerald Fitzwalter of Windsor, a Norman castellan in Wales, and Nest ferch Rhys, his Welsh wife. 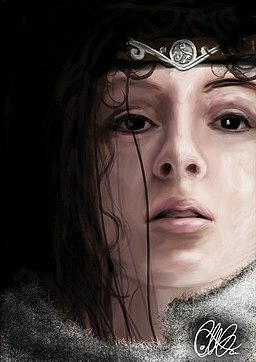 She was the daughter of Rhys ap Tewdwr, last King of Deheubarth. The Tudors were descended from Rhys ap Tewdwr’s son, Gruffydd. Gerald FitzGerald, 3rd Earl of Desmond (1335–1398), was one of the greatest of the Fitzgeralds. He was a Lord Chief Justice of Ireland and he wrote poetry in Gaelic. One of his main castles was at Lough Gur near Knockainey. Knockainey is associated with Aine. Aine is associated with midsummer and has been called the Queen of the Fairies. Others associate her with Anu. They say that he disappeared one day in Munster after shape-shifting. He is said to still live under or beside Lough Gur in a cave. One day, when Ireland most needs him, he will return. (https://medievalgill.wordpress.com/2013/07/27/the-irish-merlin-with-a-dash-of-arthur-thrown-in/ and https://en.wikipedia.org/wiki/Gerald_FitzGerald,_3rd_Earl_of_Desmond). In fact, his mother was Aveline or Eleanor, daughter of Nicholas FitzMaurice, 3rd Lord of Kerry. But he was quite a character. Given the association of Gerald Fitzgerald with myself, I continued to watch the family with interest. Gerald FitzGerald, 8th Earl of Kildare KG (born c. 1456 – c. 3 September 1513), also known as Gearóid Mór or "The Great Earl" (An tIarla Mór), was called the “uncrowned king of Ireland”. He was Lord Deputy of Ireland from 1477 to 1494, and from 1496 to 1513. He was also associated with shapeshifting. In 1513 Gerald Fitzgerald, the Great Earl, died. He is said to still live in a cave under the Curragh or plain of Kildare. Once a year, on May 1, he rides a horse around the Curragh. When he wears the horseshoes down to the thinness of a cat’s ear he will return and drive the English from Ireland (https://en.wikipedia.org/wiki/Gerald_FitzGerald,_8th_Earl_of_Kildare). The Great Earl was succeeded by his capable son, Garrett Og Fitzgerald, the 9th Earl of Kildare. But his life did not end so well for Ireland. Henry VIII feared an alliance between Ireland and Spain. Once he established himself as the head of the Church of England, he ended his relationship with the Pope and with Catholics. And he no longer trusted the Anglo-Irish, who were “more Irish than the Irish”. In 1534 he put Garrett Og into the Tower. His heir, known to history as Silken Thomas, rebelled. But his revolt was unsuccessful and he and his 5 uncles were executed in 1536. In 1536 Henry VIII forced the Irish bishops and priests to swear allegiance to him as head of the Church of Ireland. Then he dissolved the monasteries and convents. Henry VIII enforced the Statutes of Kilkenny and banned the Catholic Mass for everyone. Marriage between English Protestants and Irish Catholics was treason and was punishable by death. This tore families apart. In 1541 Henry declared himself Lord of Ireland. Eventually 40 Anglo-Irish and Irish lords and chiefs declared allegiance to Henry VIII of England. O’Neill and O’Donnell of Ulster were made Earls. The O’Neills became the Earls of Tyrone in 1542. And then, in 1547, Henry VIII died. But Ireland was never the same again. I am known as Anann Ni Meadhra, which is Anann O’Meara to the English. Some call me Annie. Ni Meadhra comes from meadhar or “merry”. My husband has gone by many names, Nuada, Aidan McAuley, Nechtan O’Flannagain, etc. Now he goes by the name Ailill (“elf”) Ó Meadhra or Ó Nuadhain. There was a brief respite in the 1680s when James II appointed an Irish Catholic, Richard Talbot, 1st Earl of Tyrconnell as Lord Deputy of Ireland. He also allowed Catholics to be Army officers and hold other offices. The confiscations of the 1650s were reversed. But this period came to an end with the “Glorious Revolution” in 1688/9, when James II was deposed by the English. My husband fought in the Cogadh an Dá Rí, the “War of the 2 Kings”, which the English know as the Jacobite or the Williamite War, between the Jacobite supporters of James II of England and Ireland (VII of Scotland) and the supporters of the Protestant Dutch prince, William of Orange (1688-1691). We were based in Galway, a merchant city which had supported the English during the 16th and 17th century but backed the Jacobites in the 1680s. The war went against us, ending with defeat at the Battle of the Boyne in 1690 and the Battle of Aughrim in 1691. The great families of Galway were ruined. The 1691 Treaty of Limerick gave full rights to Catholics who swore an Oath of Loyalty to the new English king, William III and Mary II. The new Mary, Mary II, daughter of the Catholic James II and VII, was a far cry from the Catholic Mary I (not that Mary I had been that favorably disposed towards Ireland either). After much soul searching we swore the Oath, only to have the Irish Parliament fail to follow the Treaty. The Penal Laws against Irish Catholics began in 1695 and 1698. Wow. I jumped to this one from the title alone, Nicely done. Nov 24, 2018 04:50 am The Hiding Something on Both Sides Panda - Keep it Coming!